Dying every day– to live! The last day of our trip to Morocco overlapped with the Pope’s visit. We had just completed the final module of our Certificate in Transformational Ministry at the Margins with 40 French-speaking Sub-Sahara African migrants. I was tired but excited after having spent time visiting house churches and engaging with serious missional leaders from ten or so different countries. That day, Saturday, March 30 the Pope arrived for a two-day visit. Security was tight, and only people on pre-approved lists could attend the special smaller gatherings where he was speaking. Gracie and I weren’t on any lists. Students and faculty from the ecumenical theological seminary where we were teaching who were on the list gathered excitedly, ready to travel together by bus to one of the venues. While I was waiting around, hoping to somehow be able to go, Gracie came over and asked me to help her pray for a French woman who had had a chronic illness for over 25 years. 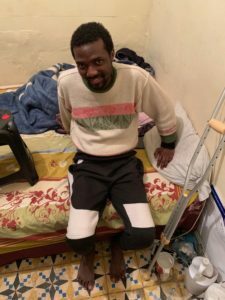 Christian, one of the African pastors who was on the list had also told me that he would rather take us to pray for a man from one of his house churches whose legs were totally paralyzed than see the Pope. He had told us that he’d likely be coming by later that afternoon to take us to this young man’s house. I wasn’t in the mood to pray for anyone- tired from four days of straight teaching and ministry in French. Jesus’ journey to the feast in Jerusalem in John 5 did come to mind though—the story where he stops at the sheep gate and prays for a man paralyzed for 38 years. Stopping and praying for this man appeared Jesus’ priority over anything else. Getting my will in alignment with Jesus’ priorities rather than seeing the Pope or being a tourist in Morocco felt like a kind of death. A Scripture from Romans 8:36 came to mind, which I’m finding myself called to remember and come under throughout each day, every day. I reluctantly agreed to pray with Gracie for the French woman, as students and faculty left excitedly to get on the bus to see the Pope. We saw the Spirit move to bring healing and freedom– a beautiful experience! As we were wrapping up we got a call from Christian, the house church pastor from Cameroon, telling us he was on his way to take us to pray for the paralytic. He flagged down a taxi and we headed out to one of the marginalized neighborhoods where many migrants find inexpensive housing (see video link below). The neighborhood had been cleansed of petty criminals—which normally abound, days prior to the Pope’s visit. We followed Christian through streets and alleys until we came to the paralyzed man’s house. As we entered the smell of urine was strong. The 26-year-old man with paralyzed legs lay on a bed- immobile. His name is Jesus! He’s a worship leader from Afrique Central (Central African Republic) who had been unable to move his legs at all for over a year. We prayed for him and saw his excitement and faith build as his back pain left and he began to move his feet and legs. He insisted on attempting to get up, without out help, and was able to stand. We left feeling like we were experiencing the verse following– Romans 8:37. As we left Jesus’ room, Christian’s five-year-old daughter tugged on his arm, telling him God was telling her to pray for a blind Morocco Muslim woman who sat by the entrance to Jesus’ apartment. Christian did an about face—returning with his daughter to the woman and her friend. He explained what God had told his daughter. The two women were deeply touched, kissing the girl’s cheeks. The little girl boldly stretched out her hand and prayed for the woman’s eye to be opened in Jesus’ name. If anyone could reach these two Moroccan women, this little girl seemed like the perfect missionary. Surrendering to Jesus’ will involves dying to our own agendas. “Being put to death all day long” might mean relinquishing our own plans, comfort, security—whatever needs to die in favor of following a higher calling. Abundant, resurrection life awaits us.